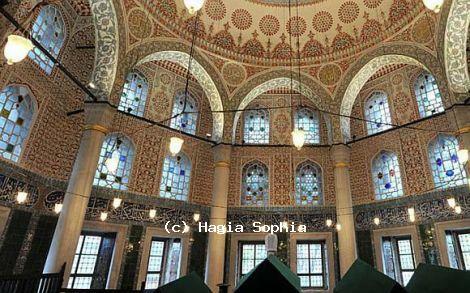 The tomb of Mehmet III was built by Architect Dalgic Ahmet Agha and all expenses paid by Ahmet I. The facade of the building coated with marble and tomb has two domes and octagonal floor plan. Entrance decorations such as flowers, landscape pictures, stars display a style beyond the usual decorations of that period. The windows are laid out in three rows and 17th century white and blue tile decorations stretches horizontally above the lowest row of windows. Hand-drawn ornaments decorate the remaining parts. New sections for the daughters of the sultans were also added on either side of the entrance gate later on. There are also inscriptions about history on the side facing the Bab-i Humayun Street. The tomb building shelters 26 sarcophagi including Sultan Ahmet I’s mother Handan Sultan, sons and daughters of Sultan Ahmet I, daughter of Murat III and other sultans’ sons.